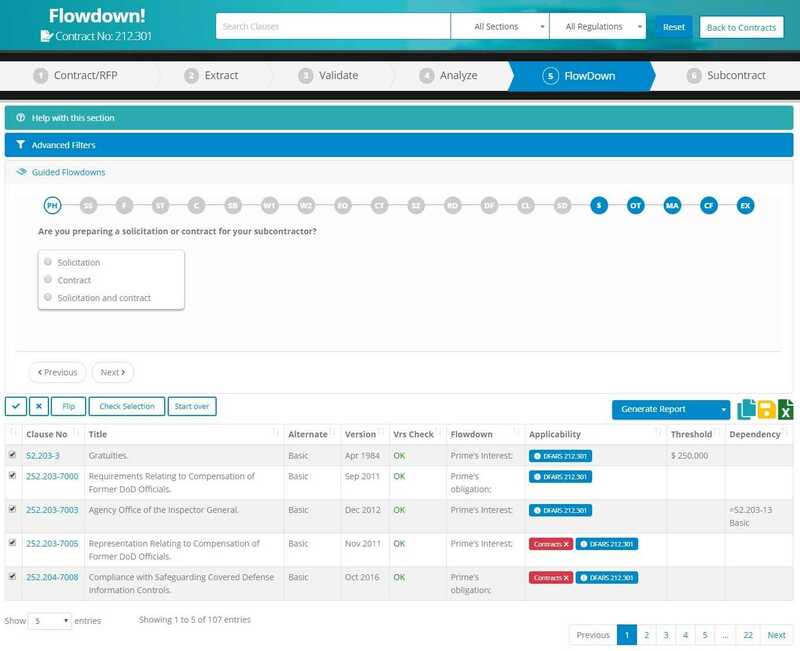 FARclause.com completely disrupts the traditional approach to reviewing compliance with the FAR and DFARS clauses and generating subcontractor flow down clauses. What can FARclause do for you? Quickly locate FAR clauses that may impact your proposal’s price and/or increase the risk performance. Validate whether your online Reps & Certs cover all provisions listed in Section K. Check if any FAR clauses contain reporting requirements not mentioned in the SOW. Identify all cybersecurity clauses incorporated by reference throughout the RFP. Locate al hidden evaluation factors (e.g. Evaluation of Compensation for Professional Employees. ), the failure to comply with could constitute a sufficient cause for the Government to reject a proposal. Understand what FAR clauses are mandatory and which ones you can negotiate out. Ensure that you account for every FAR clause in the RFP, not just those listed in Section I.
Analyze clauses in real-time for contractual risk and applicability (from Prime or Sub’s perspective) and instantly flag clauses that may conflict the general terms and conditions of your agreement. Generate a list of contracts containing certain reporting requirements or query those that include indemnity or cybersecurity provisions. Annotate clauses with corporate level comments and guidance based on your company’s policy or make your notes against clauses to be unique to each contract. Save most frequently searched or critical clauses into your list of Favorites. Quickly answer questions related to your subcontractors’ unique requirements to dynamically generate a list of proper subcontractor flow down clauses. Do I use 52.212-5 (e)(1) or 52.244-6 (c)(1) when flowing down clauses to commercial subcontracts? What FAR clauses can create conflicts with the general terms and conditions of my subcontract? Quickly find answers to the following questions: Do mandatory flow down clauses under 52.212-5 (e)(1) or 52.244-6 (c)(1) contain the same clauses? 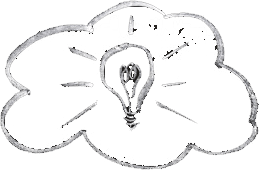 Is Section I and Section K inclusive of all clauses found throughout my RFP? Does my contract contain any clauses that are not suitable to contracts for Commercial Items? Does my contract or RFP contain the latest clauses? What clauses are impacted by the current class deviations? Do my FAR clauses require inclusion of another clause or are there any conflicts between them? Paste text from RFPs and Contracts into the FAR Magic ExtractorTM and let our site instantly retrieve clauses with versions and alternates. Perform risk and applicability analysis and generate proper subcontractor flowdowns. No need to type, scribble on paper, or waste your time on deciphering FAR Matrix! SEARCH ANNOTATE Federal Acquisition Regulation Clauses. Access Federal Acquisition Regulation (FAR), Defense Federal Acquisition Regulation Supplement (DFARS), NASA and other agency FAR supplements, all in one place. Narrow your search results to FAR titles, prescriptions, versions, subcontractor flow down requirements, or search full text of clauses and provisions. View FAR clauses’ applicability and dependency on other clauses. Quickly retrieve clauses related to Cost Accounting Standards or Certified Cost or Pricing Data those containing mandatory flow down requirements. Save your most frequently used FAR clauses to Favorites or annotate them with your personal remarks. Export multiple FAR clauses to Excel or print them in full text with prescriptions. Most efficient place to search FAR, DFARS, NASA, and other agency clauses and provisions. Instantly EXTRACT VALIDATE clauses from RFP and Contracts. 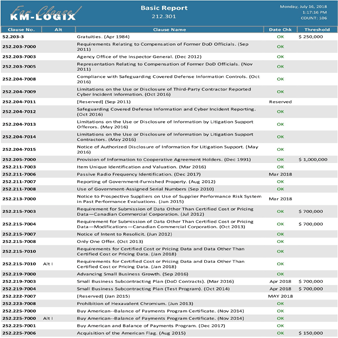 ...without typing a single clause number, retrieve FAR/DFARS clauses, including their ALT designations and versions, from Request for Proposals, Contracts, Corporate Terms and Conditions (Lockheed CORPDOC, Raytheon TC-001, Boeing H204) – no need retype any clauses or endlessly check off clauses from "master libraries or FAR matrices". Quickest and most accurate way to validate FAR clauses from Requests for Proposals and Contracts. Analyze clauses for APPLICABILITY RISK . Perform a comprehensive FAR compliance check and FAR risk analysis against your RFP or contract. Get a clearer picture of the FAR requirements by organizing your FAR clauses by uniform contract format (UCF) or by departmental interest. Analyze FAR clauses in real-time for contractual risk and subcontractor flowdown applicability (from Prime or Sub’s perspective) and instantly flag clauses that might conflict with the general Terms and Conditions of your agreement. In less than 5 minutes perform a comprehensive FAR compliance check and Reps & Certs validation against your RFP or contract. REVIEW GENERATE subcontractor flow down clauses. Dynamically generate flow down clauses relevant to your subcontractors’ work and characteristics. Since all subcontractor flowdown clauses originate directly from the prime contract, you will never have to worry about flowing too many clauses or flowing clauses that don't exist under your prime contract. 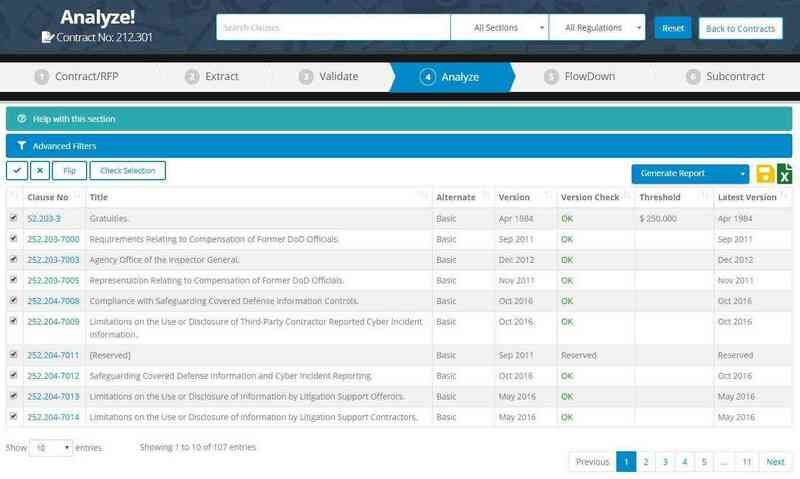 In less than 3 minutes generate the most precise flow down clauses unique to each subcontractor and keep an audit trail explaining why certain clauses were omitted/included. STORE RETRIEVE FAR clauses across all contracts. Instead of typing and tracking contract numbers and clauses spreadsheets, use our FAR repository where you will be able to retrieve all your company's contracts with an instance of the clause you are searching. 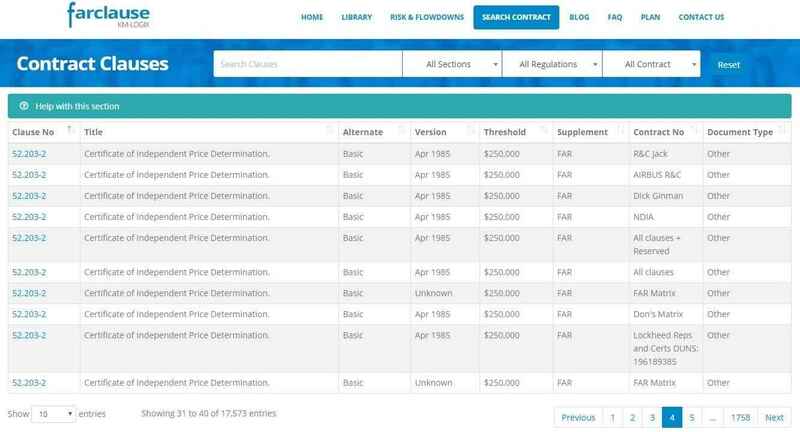 Search FAR clauses across all company’s contracts by keywords, clause numbers, or contract numbers. 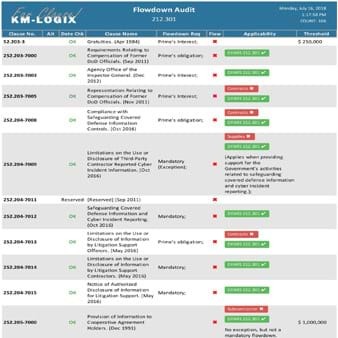 FARclause.com is the only application on the market today that let you fully meet the compliance with subcontractor flowdown requirements, a part of the Contractor Purchasing System Review (CPSR) audit. Our site holds an SSL security certificate and is backed by McAfee. In addition, you are always in control of what information you are pasting into the site. In addition to our corporate and individual users, we have lent the power behind our application to the likes of NDIA, Panel 809, DAU, and many others. We check multiple government sources, including the Federal Register, DPAP Publication Notices, Class Deviations, and other Supplements, daily to ensure you have the most up to date information. Please contact us if you are interested in hosting our application on your servers and/or want to have the capability to manage your user accounts. Please contact us for the list of APIs to help your application grow by establishing a niche in the contract management software arena unique to government contracts.